Modern art is not everyone’s cup of tea. Personally, I prefer avant-garde paintings, sculpture and other futuristic installations over gallery upon gallery of Christian imagery. And I adore the work of Picasso, Matisse and Chagall. To each his or her own, right? But even I sometimes find some modern art pieces to be, shall we say, wanting. There is a museum in Paris, however, that I highly recommend to everyone, even those who normally are turned off by modern art—the Musee National d’Art Moderne, housed in the city’s equally futuristic—and fascinating—Pompidou Center. The museum was launched in 1934 as the successor to the contemporary Musee de Luxembourg, which was created by King Louis XVIII in 1818, but wasn’t officially opened in the Palais de Tokyo on Paris’s Right Bank until 1942 due to World War II (and even then, only a small fraction of the exhibits slated for display were unveiled; most of the rest remained hidden from the occupying Nazis). The museum was fully inaugurated in 1947. 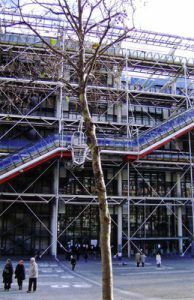 The museum moved to its location in the Pompidou Center in 1977, and occupies two floors of the facility with space for rotating temporary exhibits on another level. 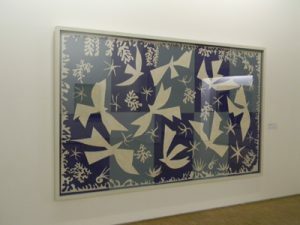 The Musee National d’Art Moderne (not to be confused with the smaller Musee d’Art Moderne de la Ville de Paris, located in the 16th Arrondissement) houses the second largest collection of modern and contemporary art in the world, with no works dating before the year 1905. Although not every piece owned by the museum is displayed (although the museum is closed each year from mid-February to mid-March to allow curators to reorganize the permanent collection to show new acquisitions or previously not-displayed pieces), the assemblageincludes more than 50,000 pieces by more than 6,400 artists from 90 nations. Among the “art schools” represented in the museum’s permanent collection are Fauvism, Cubism, Dada, Expressionism, Bauhaus, Surrealism, Nouveau Realism, Conceptual Art and Pop Art. Artists with pieces displayed include Chagall, Matisse, Dali, Picasso, Duchamp, Kandinsky, Warhol, Braque, Ernst, Pollock, Lichtenstein and many others. In addition to the expansive permanent collection, the museum hosts several temporary exhibits each year featuring some of the world’s most famous modern artists. 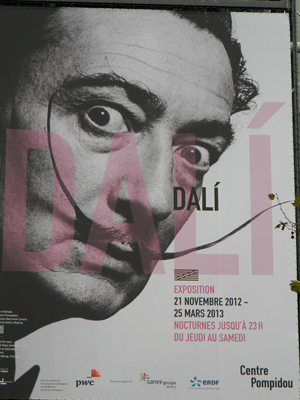 Recent shows have included a Dali retrospective in late 2012 and early 2013, “Keith Haring: The Political Line” in spring and summer 2013, “Frida and I,” a showcase of Frida Kahlo’s work, in late 2013 and early 2014, and a show of Marcel Duchamp paintings that closed this month. Currently on display is a major Jeff Koon retrospective, which runs through April 2015. Although the temporary shows typically very draw large crowds (and usually require waiting in long lines sometimes more than an hour long—both outside and then again indoors after buying a ticket), the museum’s permanent collection is often sparsely visited, particularly on weekend mornings and late-night openings. 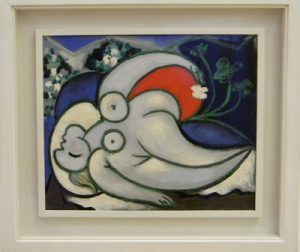 So, it’s quite possible to get up close and personal with works by Picasso, Matisse and Chagall without anyone else around. That’s a rarity for Paris museums. And that’s a major reason why I try to visit the Musee National d’Art Moderne every time I travel to the City of Light. The museum is open Monday, Wednesday and Friday-Sunday from 11 a.m. to 9 p.m., and Thursday from 11 a.m. to 11 p.m. It is closed every Tuesday. Admission is 13 euros for the permanent collection, with additional fees required to add a visit to any currently showing temporary exhibit. 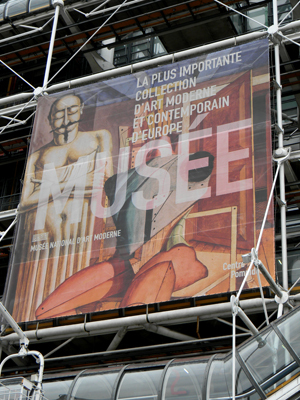 Like all Paris museums, the Musee National d’Art Moderne is free on the first Sunday of each month. Access to the Pompidou Center is via the Place Georges Pompidou (Metro: Rambuteau). This entry was posted in Art, Famous Paris destinations, Museums and Galleries, Right Bank and tagged Musee National d'Art Moderne, Pompidou Center by Bob Adams. Bookmark the permalink.